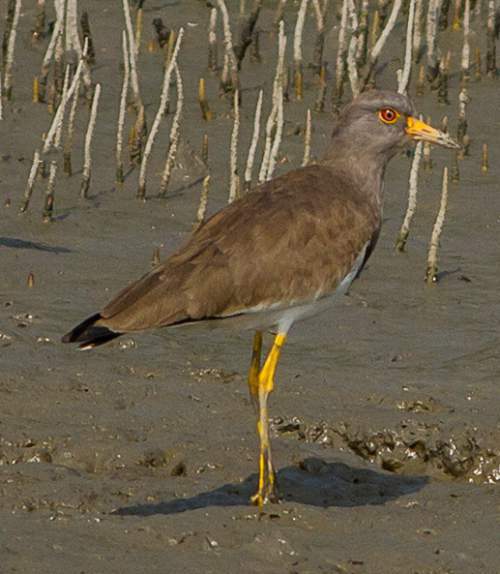 The grey-headed lapwing (Vanellus cinereus) belongs to the family Charadriidae under the order Charadriiformes. The family Charadriidae was first described by William Elford Leach, MD, FRS (2 February 1791 – 25 August 1836), an English zoologist and marine biologist, in a guide to the contents of the British Museum published in 1820. The family Charadriidae is divided into two subfamilies, Vanellinae and Charadriinae. The subfamily Charadriinae contains eight genera comprising 66 species. The subfamily Vanellinae contains two genera, viz., Erythrogonys and Vanellus. The genus Erythrogonys is a monotypic genus containing the red-kneed dotterel (Erythrogonys cinctus), a species of plover. The genus Vanellus contains 24 species. "The name "vanellus" is Latin for "little fan", vanellus being the diminutive of vannus ("winnowing fan")." The name is in reference to the sound Vanellus Spp. wings make in flight. The species Vanellus cinereus was first described by Edward Blyth in 1842. 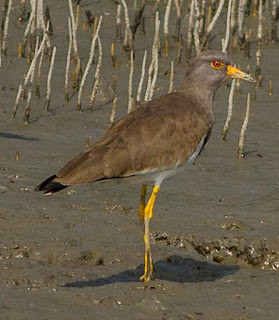 Current topic in Birds of India: Grey-headed lapwing (Vanellus cinereus) photos. Contact State Tourism or travel agents for bird watching and wildlife tours. This work is licensed under a Creative Commons Attribution-Share Alike 3.0 Unported License. Please attribute the images to their authors as per their licenses.